Diabetes can increase the risk of bone loss, and the severity of diabetes can determine its impact on bone health. 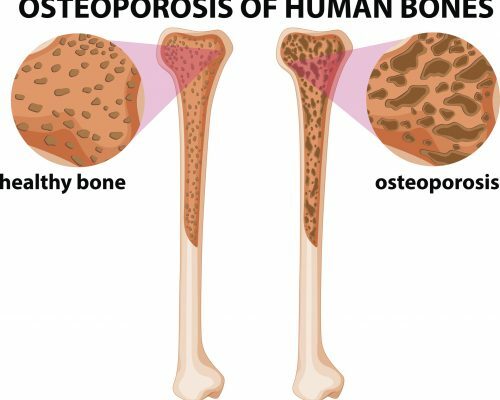 Osteoporosis is a consequence of diabetes, and both diabetes and osteoporosis have a high prevalence in America. The likelihood of developing both conditions increases with aging. Type 1 diabetes causes bone mineral density loss, weakening the bones and thus leading to osteoporosis. In type 2 diabetes, though, there isn’t a great loss in bone mineral density. In fact, type 2 diabetics tend to have higher bone mass density than average. Unfortunately, many of these patients tend to be overweight, and that extra weight contributes to bone loss and bone weakening over time. Many studies have even shown that type 2 diabetics, even with above average bone mineral density, are still at a higher risk for bone fractures. Previous studies found that bone fractures can still occur in persons with above average bone mineral density, and the Mayo Clinic study confirmed this. The researchers looked at 60 postmenopausal women – half of them had diabetes. The researchers measured the women’s bone material strength and found that diabetics had weaker bone material strength. Women with lower bone material strength had higher blood sugar levels over the course of 10 years, showing the negative impact of high blood sugar levels on bones. “We suspected that the response of diabetic bone to mechanical loading would be compromised due to impaired mechanosensing of osteocytes under hyperglycemic, or high blood sugar, conditions,” she added. The study found that exercise-induced bone formation was maintained in mildly diabetic mice at similar levels as in non-diabetic controls. Unfortunately, the benefits of exercise were not seen in severely diabetic mice. “Our work demonstrates that diabetic bone can respond to exercise when the hyperglycemia is not severe, which suggests that mechanical interventions may be useful to improve bone health and reduce fracture risk in mildly affected diabetic patients. Coming at it from the other side, our results stress the importance of maintaining good control of blood sugar in diabetic patients, so that exercise can do its work in maintaining bone health,” concluded Wang. Osteoporosis treatment may become compromised in individuals with diabetes. It’s important to try and prevent both osteoporosis and diabetes (type 2 that is) as much as possible to avoid complications and reduce the risk of bone fractures. The good news is, many of the prevention and management tips for osteoporosis apply for type 2 diabetes, too – the key is overall healthy living. Here are the lifestyle changes you need to make to manage osteoporosis and diabetes – and prevent both conditions if you aren’t diagnosed. Food and diet: Ensure you are getting in plenty of calcium and vitamin D and speak to your doctor about the necessity of calcium supplements. For the most part, calcium can be enjoyed through dietary means – and not just dairy. Many dark leafy greens can provide you with calcium as well. Exercise: Weight-bearing exercises help build stronger bones and help you lose weight. Having extra pounds puts increased pressure on bones, weakening them over time. The take-home message here is, build muscle and lose the fat for stronger bones. Medications: Your doctor may be able to prescribe you specific medications to help keep your bones strong. These medications help boost bone-resorbing cells, preventing the bones from breaking down as easily and quickly over time. Healthy lifestyle: Don’t smoke, as smoking had been found to contribute to weak bones by reducing calcium absorption. Alcohol can also negatively impact your bones, so keep your drinking to a minimum. You will want to undergo a bone density test to determine your risk of fractures and check the status of your bone mineral density. By following these tips, you can work to create stronger bones – with or without diabetes – and reduce your risk of dangerous fractures.